You may recall that I have recently been rather critical of continuous run (roundy-roundy) layouts, especially at exhibitions. The criticism has perhaps been less of the concept, and perhaps more of the fact that there has been a ‘sameness’ between many of the designs. I’ve continued to think about layout design – in relatively small spaces, not the expanse of amazing layouts like James Street, Copenhagen Fields or Fencehouses – and have come up with some examples of typical ‘types’ of layout. 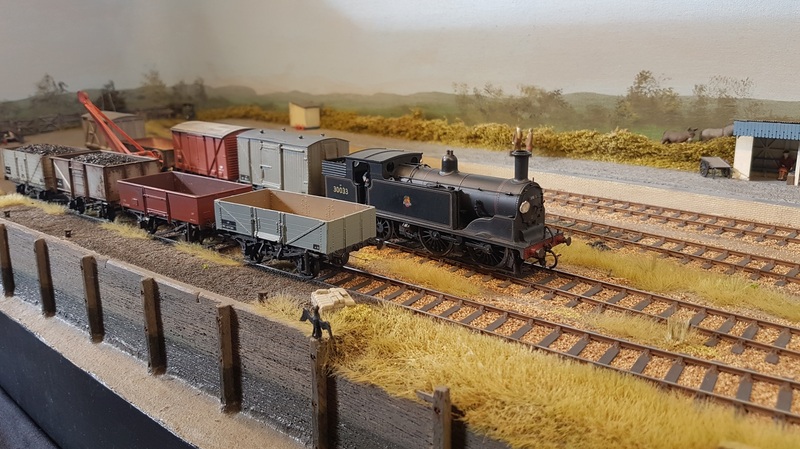 We’ll start with the working diorama, and Mike Cougill’s newest layout. This is in Finescale ‘O’ and is 24′ long by 15″ wide. This isn’t that small in British eyes, but this would be about 7′ long in ‘N’. There are some interesting ideas here. 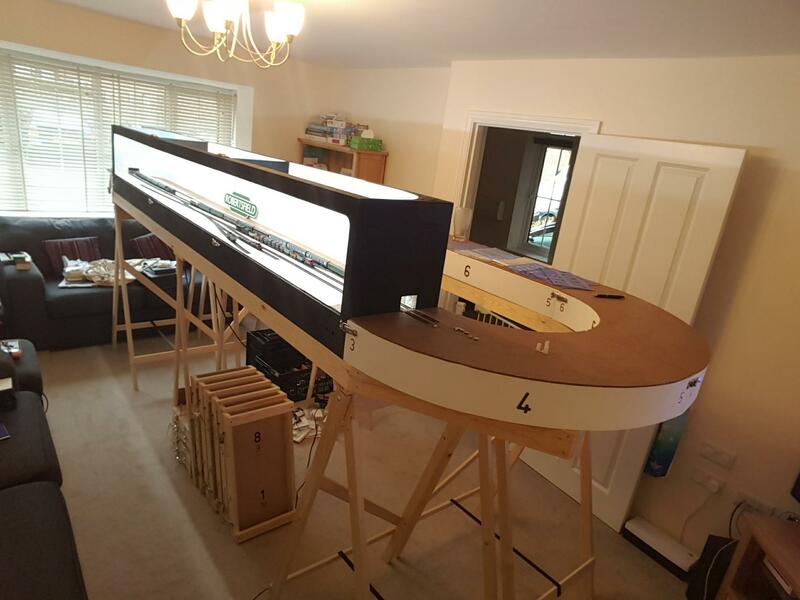 The visible section of the layout is only 1/3 of its length, with staging areas at either end. The aim is not to present a full yard or terminus, but to create a snapshot of the main area of interest. It’s going to be scenically very simple, and the eye concentrates on the scratch-built rolling stock. But thanks to the staging at each end, the layout can be operated realistically, feeding the industry off to the left. I like this concept, as it is attainable, and concentrates on the most interesting part of the yard – the few points that lead to it. This is much the same as Iain Rice’s ‘Bitsa Station’ concept, where you model the trackwork in the station through, and perhaps the platform ends, as this is where the interest is. Next concept is the small branch line terminus, typified by my recent interest in Bembridge, Isle of Wight. This is captured perfectly by the Lower Exbury P4 layout, that I recently saw again at the Farnham show. A layout like this is again attainable, and can have a lot of character in a small space. The problem with a real prototype, such as Bembridge, is that one is strictly tied to a limited range of stock for the layout. Lower Exbury is more forgiving, as it is a light railway, the scenery is from the south coast of England, but could be elsewhere, so any small locomotive and regional stock could make an appearance. More complex, but needing little more room – though urban termini are often smaller than branch line stations – is the Minories concept. There have been a million variations on this, but my favourite is Howard Bolton’s version in P4, that had some wonderfully complex pointwork, and the points operated by full point rodding. Note how the ‘Bitsa Station’ concept has been used to lose the rather boring 12 coaches of platform that lie off to the left, and concentrate on the station throat. Now, finally they cry, to the roundy-roundy. 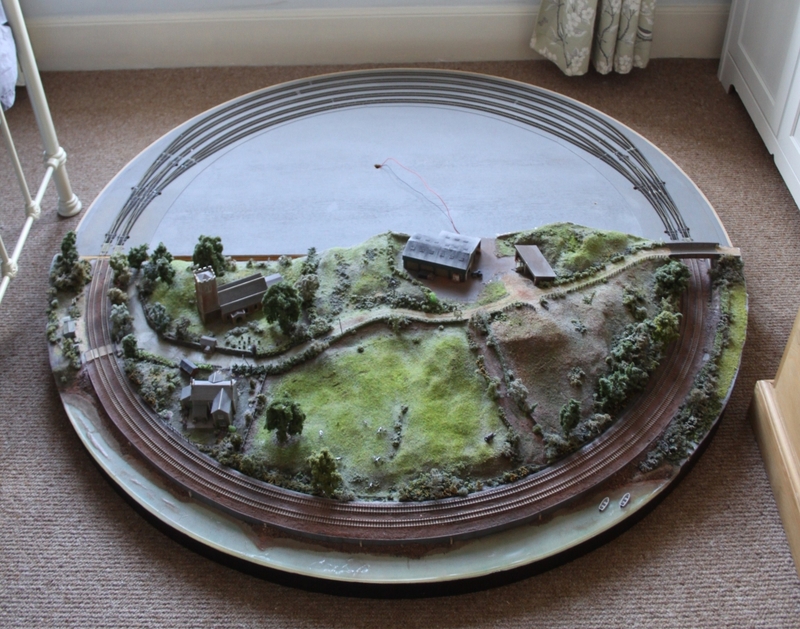 This is Powderham, a 5′ diameter ‘N’ gauge circle. I dropped this photograph from RMWeb a couple of years ago when the layout was up for sale. Very simple, but satisfying, and enough storage behind to run a sequence of trains through the scenic section. Perhaps this is the best continuous run layout that I have seen recently (well, I haven’t actually seen it – but hope to). 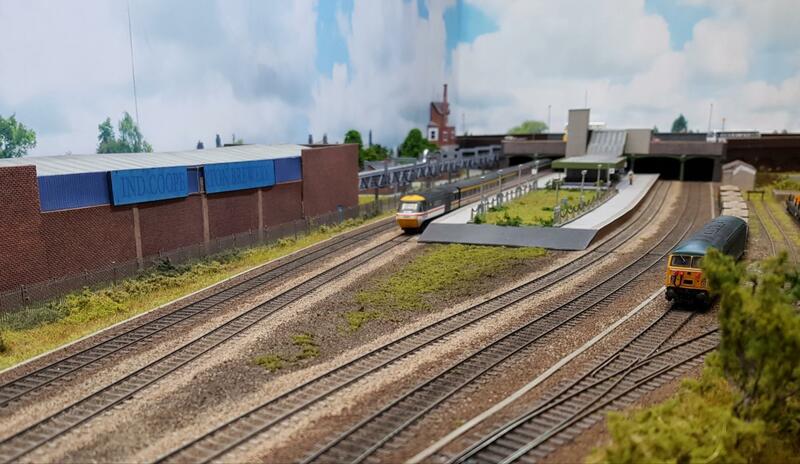 RBE’s Burton-on-Trent has a viewable section just 6′ long, but looks spacious, and as the builder says, “6′ is long enough to let the trains stretch their legs.” It’s also recognisable as Burton, and note the ‘Bitsa’ – well half-a – station approach. What I note about this design is the way that the four tracks through the station are narrowed down to one and two tracks entering the fiddle yard. We couldn’t do that with our ESNG modules, as we want four trains in motion. 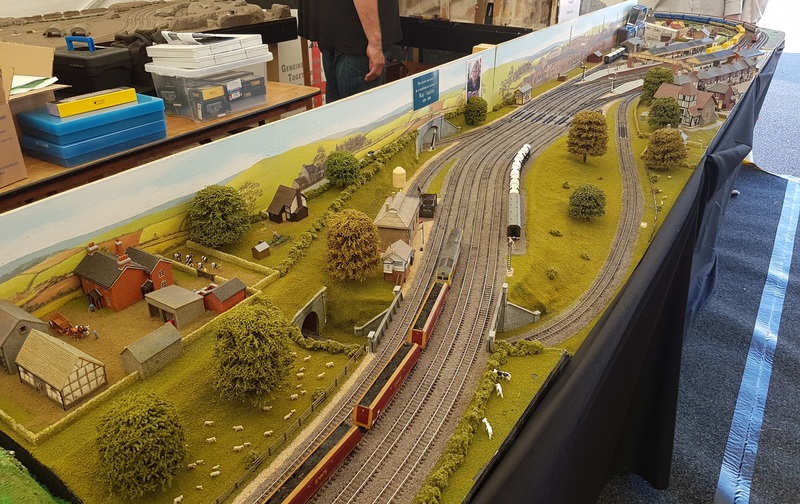 But with a closer to scale model like this, it is possible to have a more flexible fiddle yard, but still have two trains out on the main line. Then there’s Mark Pelham’ Robertsfield, a Southern Region layout in ‘N’. This is quite large, with a 12′ viewable section, but I like this layout for it’s use of laser-cut baseboards – especially the end loops. 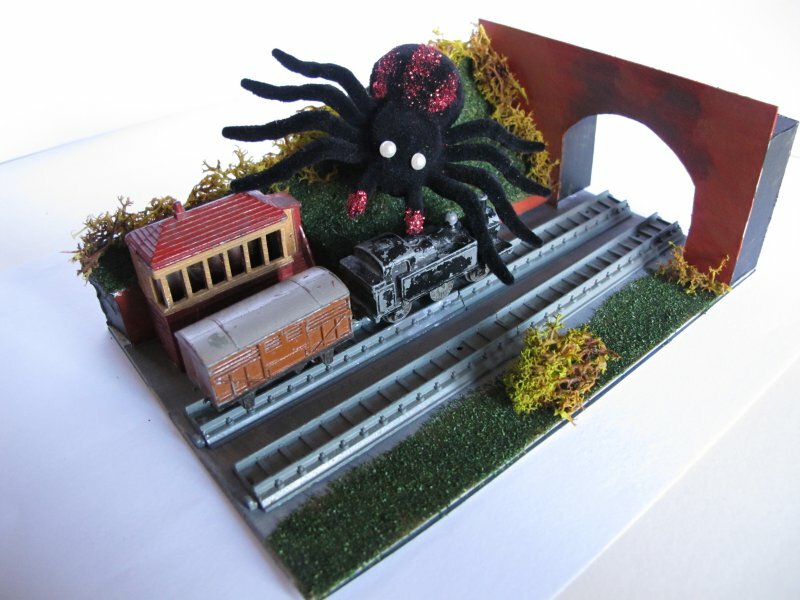 This entry was posted in Jon's layout ramblings, Layout design and tagged Layout design, model railway, N gauge. Bookmark the permalink.